The sea spit out a starfish while I gazed at a large ship on the horizon. Surprised by the beached creature, I instinctively took a step back. Then I reached to pick it up and chuck it back to sea. When I got close I saw all these tiny moving arms (real term: unknownst to me) and, quite frankly speaking, they spooked me. I didn't want to touch the creature. By the time I decided it was harmless--though weird what with all the lifting of each radial in turn trying to flip itself over-- I also decided that I shouldn't just throw it back to the sea. The scientist kicked in and I just observed without involvement. I watched fascinated by the whole ordeal. 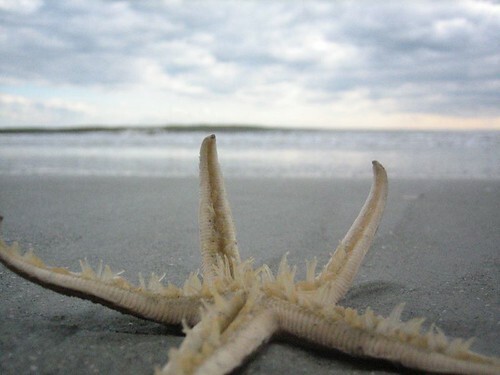 I've never seen a living starfish. I didn't know it's radial arms could flex so much. I didn't know it was covered with little flagella-looking arms that seem to feed a mouth in the center. And I've certainly watched only a very few creatures larger than housefly die. It was beautiful. I could pretend I'm a naturalist a lot more often!